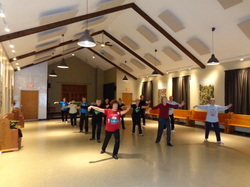 Welcome to Fung Loy Kok Taoist Tai Chi™! We are a registered charitable organization founded by Master Moy Lin Shin in 1970. Master Moy was a Taoist monk who studied Taoist arts of transformation for decades in China and Hong Kong before coming to Canada. All of our branches are united by his vision which includes a single set of Aims and Objectives: to make Taoist Tai Chi™ arts available to all, to promote the health improving qualities of Taoist Tai Chi™ arts, to promote cultural exchange, and to help others. relaxed and accessible to people of all ages and abilities. Our goal is that you feel balanced and comfortable and that you have fun. We encourage you to attend as many classes as are available to you. Don’t worry too much about learning the sequence of 108 moves in exactly the right order or even memorizing it. This will come with time, so just relax! internal arts and to feel and enjoy its many benefits more quickly.